When most people think about dieting and losing weight, they immediately associate these thoughts with eating less and consuming fewer overall calories per day. Although there very well may be a need to cut calories and eat less, most people tend to cut out the wrong foods at the wrong time during the day in order to produce optimal, healthy weight loss. When it comes to cutting out foods and/or entire meals, most people tend to find it most convenient to cut out breakfast. The reason being is that breakfast is the meal that is easiest to miss on busy mornings that also require getting ready for work, getting the kids ready for school and dropping the kids off on time. If breakfast is not cut out altogether, it often has the tendency to be the least healthy meal of the day. This is due to the ease of going through a drive through for a quick cup of coffee and pastry or an unhealthy breakfast sandwich at one of the popular fast food staples around town. Even though breakfast may be the easiest meal of the day to cut out, it is essential to weight loss and maintaining healthy weight loss for the long run. Most tend to disbelieve the idea that eating more each day could possibly lead to healthy weight loss and improved overall health, but numerous studies have proved this time and time again. A study published in the journal Pediatrics studied over 2,000 teens and young adults from 15 to 20 years of age. Researchers discovered that there was a lower body mass index (BMI) associated with those young adults that ate breakfast more often and on a regular basis. The results of this study were independent of all other study factors including age, race, gender and socioeconomic level. In addition, those that ate breakfast on a regular basis actually weighed less, even if they consumed a higher number of calories each day. Eating a healthy, nutrient rich breakfast each day not only helps promote weight loss and maintain a healthy weight, it also improves overall health and helps prevent illnesses and ailments such as diabetes and heart disease. In a study conducted in conjunction with the American Diabetes Association at the University of Colorado, Dr. Elizabeth Thomas studied the effects of women who skipped their morning meal. Dr. Thomas measured the women’s insulin and blood sugar levels for two days after eating lunch. The first day, the women at lunch but skipped breakfast, and the second they ate both breakfast and lunch. Since glucose levels typically rise after each meal, you would expect glucose levels to be higher on the day the women at both meals. The results were the actually the opposite. The women’s insulin and blood glucose levels were considerably higher on the day they skipped breakfast compared to the day they ate a healthy breakfast meal. Eating breakfast can not only maintain healthy insulin levels, more importantly, it can reduce the risk of diabetes among overweight women more prone to the disease. In addition to the reasons above, eating a healthy breakfast also has plenty of other positive benefits. A healthy breakfast can help improve metabolism, curb hunger, improve mood, increase energy, improve heart health, maintain lower body fat levels and most importantly, help with weight loss. By consuming your first meal of the day soon after you wake up, you are able to ignite your body’s metabolism and help it begin working immediately. When breakfast is skipped, the metabolism thinks the body is fasting and slows down its efficiency in order to maintain the energy it has for the remainder of the day. The body will then store fat and calories consumed the day before and not begin working efficiently until you consume your first meal, usually at around lunch time. Eating a healthy, balanced breakfast can help prevent hunger later in the day and prevent consuming unhealthy food options that may present themselves in the office. If you skip breakfast, you may be tempted to reach for the donuts, bagels or sugar laden options that you see in the office conference room or the pastry case at the coffee shop. By eating a healthy, balanced breakfast before you get to the office, you will help prevent hunger that will strike before lunch time. This will help you stay on track with your weight loss goals and stay away from unhealthy snack options in the vending machine or at the office meeting. Eating a healthy breakfast helps maintain stable insulin levels, as shown previously in studies conducted. In turn, maintaining healthy insulin levels leads to improved overall mood throughout the day. Studies have shown that people that consume breakfast on a regular basis are not only healthier, they are happier as well. For the most part, if you are happier, you will also tend to make better food choices and not eat foods that will hamper your weight loss goals. Improved mood as a result of eating a healthy breakfast is not only beneficial for adults but for children as well. Children that consumed a healthy breakfast tend to have more self-control and fewer emotional and behavioral problems. This will lead to more success in school as well. 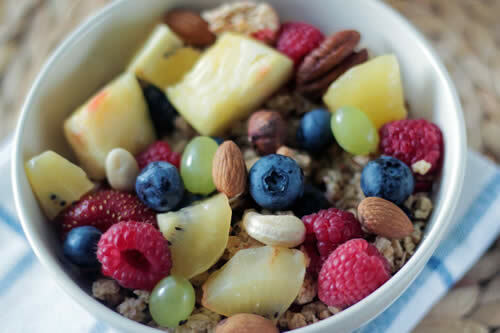 Eating is what gives us the energy to make it through the day, so it is no surprise that eating a healthy breakfast helps provide the body with increased energy to make it through a busy day. When breakfast is skipped, insulin levels drop and you tend to feel tired and hungry. This can carry into the afternoon and will most likely lead to skipped workouts or workouts that are not to your full potential. In order to reach your weight loss goals, you will need to consume a healthy, balanced meal at the start of your day. This will help give you stable energy levels through lunch time and into the afternoon when you hit the gym to get it done. Not only is breakfast the most important meal of the day for weight loss, it can also be lifesaving. Eating breakfast has repeatedly been shown to lower the risk of heart disease in both men and women. According to a study published in Circulation, men who skipped breakfast have a 27% higher chance of suffering from fatal coronary disease when compared to others that consumed a healthy, balanced meal in the morning. For women, the studies showed similar results. A study conducted by the American Journal of Clinical Nutrition studied women who skipped breakfast even just once a week. Results showed that women who skipped their morning meal just once a week or more were 20% more likely to develop type 2 diabetes than those who ate breakfast regularly. The risk was even higher among overweight women. When you choose to skip breakfast, you are sending a signal to your body that you are temporarily starving it, whether this is intentional or not. What the body then decides to do is go into survival mode and hold onto any fat that it may have in order to survive for the remainder of the day. This will lead to weight gain and higher body fat levels. In order to lower your body fat, it is essential to spark your body and begin fat burning as soon as possible. When you wake up in the morning, it is important to consume a small, balanced meal in order to let your body know that you are providing it with fuel and it can burn what was previously stored. A study conducted by the University of Massachusetts Medical school showed that people who skipped their morning meal on a regular basis were 450% more likely to be overweight than their counterparts who ate breakfast. This was not only the case with adults, but with children as well. The studies and reasons for eating a nutritionally balanced breakfast each day clearly show the abundant benefits of what a healthy morning meal can provide, not only for overall health but for weight loss benefits as well. Now that you know why you need to avoid skipping your morning meal, you need to learn how to implement a healthy, balanced breakfast into a hectic morning schedule and make sure it becomes a habit for you and your family. When it comes to breakfast choices, it seems that the easiest options are those that lack nutritional value. Bagels, donuts, cereals, sugary coffee drinks, fast food breakfast sandwiches and sugary flavored milk options can be some of the easiest options in the morning, but they are also the least beneficial. These foods tend to be high in fat, sugar and carbohydrates, and they are also low in fiber, protein and essential nutrients. What these types of “easy” breakfast foods tend to do is quickly elevate the body’s blood sugar, creating a larger crash in the afternoon. This will lead to fatigue, higher body fat percentage and a malfunctioning metabolism. In reality, eating the wrong foods is almost as bad as not eating breakfast at all. So, what should you eat in the morning? The best choices for morning meals include a substantial quantity of protein, combined with healthy fats, fiber and healthy carbohydrates for energy. Protein helps keep you full, preventing cravings that strike before lunch time. It also helps optimize brain function and elevate your mood throughout the day. Healthy, low glycemic carbohydrates work in conjunction with protein to maintain concentration and attention throughout the day. This will help you make it through a long workday, and help your kids make it through a tiring day at school. Adding in healthy fats and fiber will help the digestive system work well, processing your meal and preparing you for the day ahead. If nutrition is not your forte, you can still make healthy options when it comes to eating a healthy breakfast. Below is a long list of foods you can combine daily to ensure you are eating a healthy, balanced meal that will help sustain your energy levels and mood throughout the day. These foods can also be essential in helping you reach your weight loss goals. When it comes to eating the best breakfast for weight loss, it is important to choose a serving from most of the groups below and combine them into a delicious, healthy meal. Not sure how to combine these foods into a morning meal? Read on for some healthy breakfast ideas and breakfast recipes that you and your family can enjoy. Make the protein pancakes according to the recipe below and top them with a teaspoon of almond butter. Add berries of your choice, such as raspberries, blueberries or blackberries on top, and enjoy! Combine all of the ingredients above in a bowl. Heat a skillet and make pancakes as you would regular pancakes made with a mix. A bowl with a half cup of low fat cottage cheese served alongside a sliced apple topped with 1 tablespoon of peanut butter. Egg White Omelet with Spinach, Mushrooms and Feta Cheese with a side of Turkey Bacon Combine three egg whites in a skillet. Top with 1 ounce of feta cheese and your desired amount of fresh spinach and mushrooms. Add 2-3 slices of turkey bacon cooked in a skillet or heated for a few minutes in the microwave. Fill a high fiber, low carbohydrate tortilla (such as La Tortilla Low Carb High Fiber Tortillas) with low fat cream cheese, spinach, mushrooms and chopped, precooked turkey sausage. Roll into a burrito and top with fresh a few tablespoons of salsa. Start with a whole grain English muffin and toast to your liking. Add 2 scrambled egg whites, low fat turkey sausage and top with a slice of low fat cheese.